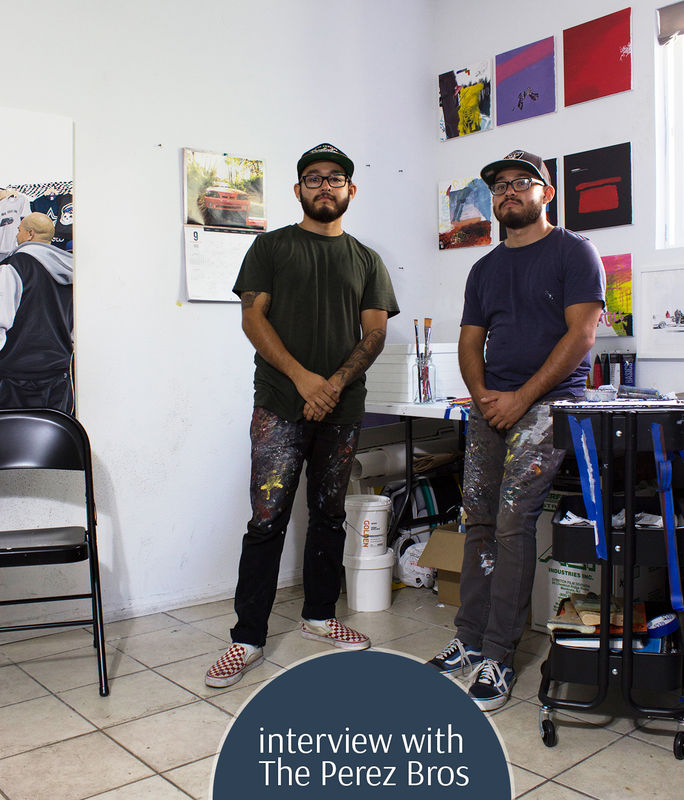 Interview with TikToy for "Timewarp"
We’re excited to bring The Perez Bros in the Thinkspace fold, showing a few pieces from the duo in the Thinkspace office this month. The Perez Bros are identical twin brothers Alejandro and Vicente (born 1994) from South Gate, CA. After graduating from South East High School, they attended Otis College of Art and Design to pursue a degree in Fine Art focusing on painting. At Otis is where they began to work together as a collaboration duo. They were exposed to Los Angeles’s car culture at a very young age, their father being a part of a lowrider car club for as long as they can remember. 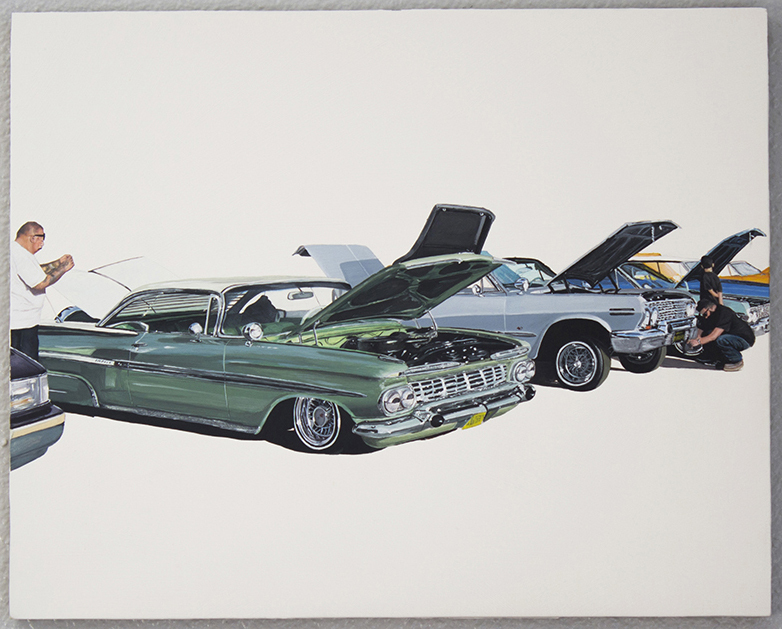 Fascinated with the culture, from the cars to the models, from the people to the music; through their paintings, they try and capture moments they witness at car shows. 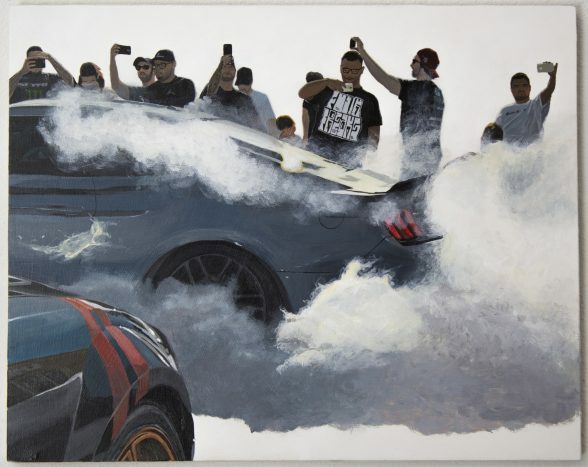 Larger paintings seem to invoke the mood and feeling of these car events, while smaller paintings encapsulate more intimate scenes. Through their work, they aim to bring the viewer into their world and a part of a culture that is their second home. SH: How do you approach developing a new body of work? PB: To be honest, we converse a lot daily, and within those conversations, different ideas come up and we agree and act upon them pretty quickly. SH: Where do you source inspiration? What are some of your favorite spots to take photo reference at? PB: We don’t really look at other artists for inspiration, instead we get inspired by music. We’re influenced by song lyrics and watching interviews of our favorite artists. We hope that our audience is able to relate to us and our work, like people relate to music and artists. We get all of our photo references at car shows; particularly Lowrider shows and Mustang events. SH: What excites you about your work / creative process? show events and taking pictures of the cars and people. We also enjoy every step that comes after: going through our photos and deciding which ones would make great paintings, building our canvases, applying the gesso, and then actually creating the painting. But what we enjoy the most is completing a painting and seeing our ideas come to life. SH: What frustrates you about your work / creative process? anything interesting or inspiring to photograph. We leave the car event empty handed with no photo references for future paintings. SH: When did the two of you first start working together as a duo? PB: We first started to work together in our sophomore year at Otis College. We had an assignment to collaborate with someone in our painting class taught by Scott Grieger, which we naturally chose to team up together. After that, it became clear to us that this is what we should be doing. SH: Who is an artist; musician, director, any art form – who would be a dream collaboration for you and what would you create? artwork for one of his albums. SH: Has there been someone or some event that has made a significant impact on you that lead you to where you are now? An artistic catalyst of sorts? PB: Our High School art teacher Ms. Tinajero influenced us to apply to art school, so we would say she definitely had a big significance in leading us to where we’re at now. She believed in our talent and always pushed us to work harder. We applied to Otis College and got accepted. Attending art school helped us find our voice and take our art seriously. Without Ms. Tinajero and Otis College, we don’t think we would be where we are at right now. SH: What’s in your toolbox? AKA what paints, brushes, tools would we find in your studio? 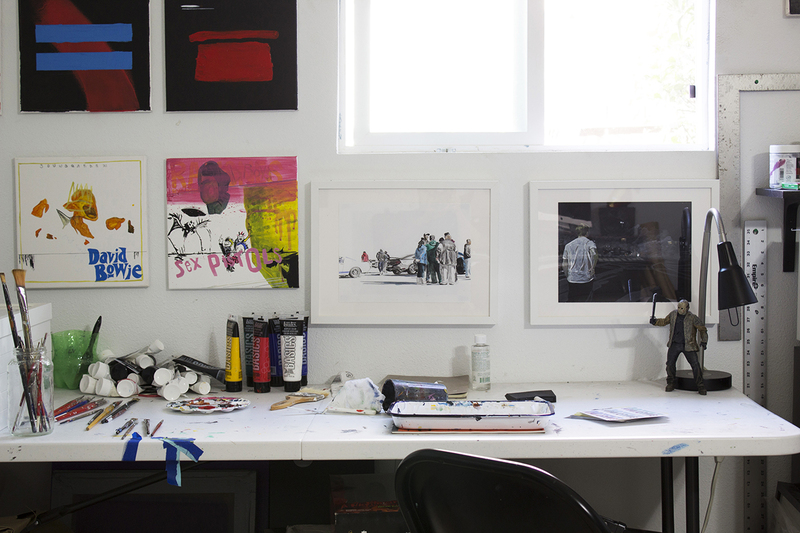 What do you wish was in your studio? 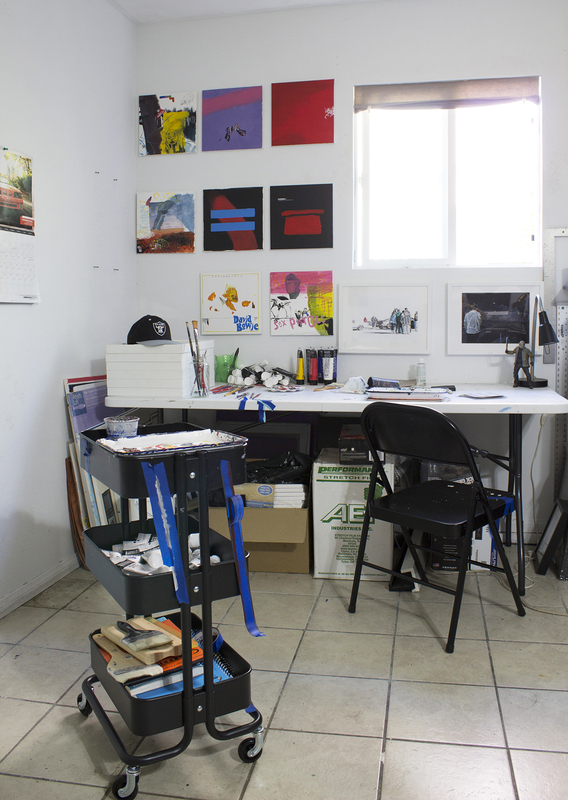 PB: In our studio you would find a lot of Liquitex acrylic paint and gesso, brushes, raw canvas, stretcher bar tools. Just your basic tools to create acrylic paintings on canvas. You would also find a Bluetooth speaker, because music is a must. A tv and video games for when we need a break from painting. And a mini fridge and microwave, because artists also have to eat. SH: Does your background noise influence the mood of the pieces? What’s on repeat in the studio at the moment? PB: Yea, music has a big influence on our work. We can’t work on a painting without having music playing in the background. At the moment we have Kid Cudi, Mac Miller, Travis Scott, Interpol, and The Strokes playing in a constant rotation. Barnsdall Park at 4800 Hollywood Boulevard in Los Angeles, California. (Los Angeles) – The Los Angeles Municipal Art Gallery and Juxtapoz magazine are pleased to present 20 Years Under the Influence of Juxtapoz, a group exhibition to commemorate two decades of the magazine’s influential contribution to contemporary art and culture. On view at the Los Angeles Municipal Art Gallery, and curated by Andrew Hosner of Thinkspace Gallery and Gary Pressman of Copro Gallery, the exhibition features close to one hundred artists who have graced the publication’s pages and website, and showcases the diversity and breadth of the New Contemporary movement Juxtapoz has championed and helped to uphold. In 1994 in San Francisco, Robert Williams, Craig Stecyk, Greg Escalante, Eric Swenson and Fausto Vitello founded Juxtapoz with the intent of fostering the art and culture of the underground. Providing an alternative voice and narrative as a counterpart to the dominant New York-centric discourse of contemporary art, it featured artists who straddled “high” and “low” culture. Aligning itself with the aesthetics of contemporary street culture, figurative art, California car culture, gig posters, tattoos, graphics, psychedelia and comics, the publication became a conduit and forum for an entirely new generation of artists who were latching on to the visual vernacular of powerfully populist themes. At a time when representational forms of art were widely disparaged by the reigning critical discourse of the art world, a discourse which championed hyper-conceptual and minimalist dogmas, Juxtapoz provided a mouth piece for the New Contemporary movement. Fluid rather than prescriptive, this movement has many monikers but is united by an ethos. The expressive possibilities afforded by figurative or representational work came to the fore, and a democratic sensibility was unleashed. What once began as an alternative magazine is now the most widely disseminated art publication in the world. Predicated on the rejection of the artificial boundaries that consecrated “high”, Juxtapoz effectively broke down walls to allow young artists a chance at their own history. It is also an ideal that attests to the power of making accessible art about shared cultural experiences, identities and aesthetics. The artists featured in this exhibition have been chosen based for their impact on the movement, and on how they themselves have been motivated by such an abundance of inspiration. With access to this imagery and community, new and multifaceted generations of artists continue to emerge from the ranks. Avenues made possible by Juxtapoz, through its wide variety of featured media and expressions, have shaped this aesthetic and preserves its trajectory as far as the imagination will allow.